Montreal's small press, comic and zine fair, Expozine, is happening this weekend at the St-Enfant Jésus Church on St-Dominque Street in the Mile End. 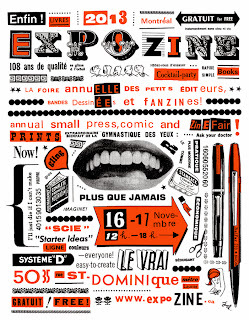 Expozine started in 2002 in order showcase the multitude of publications that fall outside the mainstream. Since then, it has become one of the centrepieces of alternative publishing in North America. It is also one of my favourite events. As I walked up to the entrance of the long hallway leading to Little Burgundy Room, formerly known as the church basement, I couldn't help but notice all the people congregated outside on this uncharacteristically sunny November afternoon. Then I recalled how hot the basement was in previous years and quickly took off my coat. This year there are more than 270 exhibitors, and at 4:00 yesterday, the room was jammed full of people. This is an over-the-top fun event that is best enjoyed earlier in the afternoon when there is plenty of infectious enthusiasm among the creative people anxious to show off their latest work. By late afternoon, the heat hampers some of that exuberance. The collection of handmade zines, buttons and T-shirts was as deliciously eclectic as ever, but there's quite a bit more polish to the work now than in previous years. Word is evidently out that internationally renowned comic publishers scout new talent at this event. 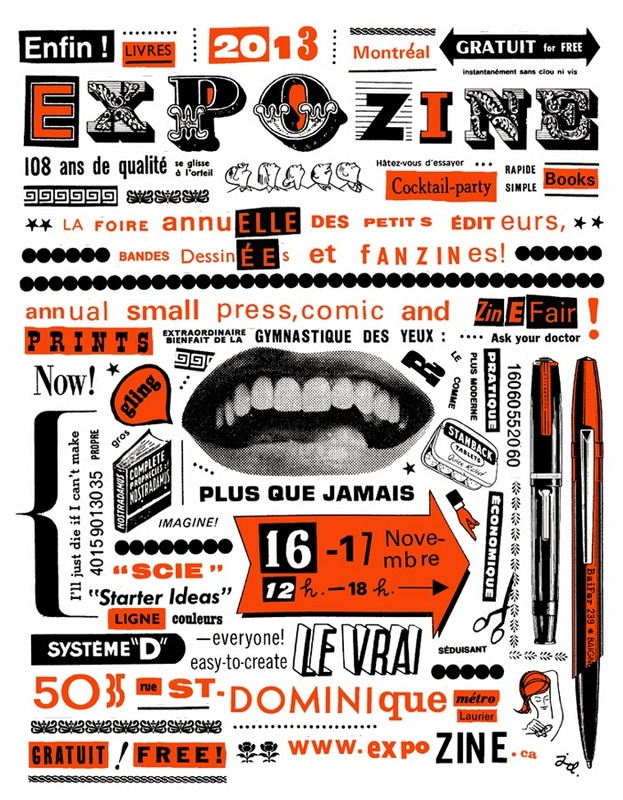 Last June, Drawn and Quarterly Associate Publisher Peggy Burns told CBC radio that Montreal's Expozine was one of three fairs in North America where the publisher looked for new artists with new mini comics. Yesterday, Publisher Andy Brown of Conundrum Press told me that he, too, shopped for new talent at Expozine. Every year, I track down a few artists I have been watching over the years, wondering if this will be the year of their big break. I spotted the dark yet hilarious Richard Suicide and the charming Hasemeister, but did not find Iris, a young comic artist originally from Gatineau who creates intriguing and highly believable female characters. Visitors will inevitably find some of their own favourites. If you're looking for some artistic inspiration drop by the Expozine, Canada's largest zine fair. To really enjoy the event, you might want to wear a short-sleeved shirt. If not, they serve beer. This has been cross-posted at Rover Arts. : Zines, Zines, ZinesTweet this!